You might have heard that Self-Publishing Roundtable have partnered with a number of other pro-indie organisations to help promote an awesome event for Indie Authors in the located in the US and Canada. And you might have wondered, what’s that all about? We invited Allie McKinney, one of the organisers behind the Indie Author Day event, to fill you in. 1) What is Indie Author Day? Indie Author Day is an opportunity for the indie community to come together in the library to help local authors get discovered and for readers to find great new books from local writers. 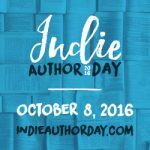 In addition to the inaugural event that will be happening on October 8th, 2016, the Indie Author Day community will offer programming on the indieauthorday.com website to help libraries and authors stay connected throughout the year. One question that we get a lot after defining Indie Author Day is what we mean when we say “indie.” When we say “indie,” we are being as inclusive as possible, so indie can mean authors that are self-published, those that have been published by a small, indie press or even hybrid authors who have both self-published and have been traditionally published. This way, writers who attend these events have the opportunity to learn from the experiences of authors from across the industry. 2) What happens during Indie Author Day? On Indie Author Day, libraries across North America will be hosting individual events to support their local indie authors. Some will be hosting workshops, marketing classes and author talks while others will be doing readings and signings. Then, at 2 pm EST, all of the participating libraries will tune in as a panel of publishing industry specialists offers insights and inspiration for the writers attending each event. This presentation will give the event a more global feel, and those who do not live near a participating library will be able to view the live streaming event through the Indie Author Day YouTube Channel. 3) How can indie authors get involved and why should they? Authors are encouraged to visit the where page on the Indie Author Day website to find out where their nearest participating library is located. At this point, most libraries have finished planning their events, but even if an author isn’t speaking on Indie Author Day, going to the library to support other indie authors as well as network, learn from industry specialists and other indie authors, meet their local librarians, attend workshops and discover new books from within their communities is incredibly valuable. Plus, the more people who attend each event, the more the libraries can see how important events that support local indie writers are in their communities. Authors should visit their libraries’ websites and Facebook pages or contact their nearest participating library to find out the details of each particular event. Then, get out there and attend the event on October 8th and meet others who care about indie publishing! 5) What inspired you / the organisation to create this event? This event actually emerged out of a need that existed within the SELF-e program for libraries to be able to connect with and support the local authors who were submitting their eBooks to be included in the library. The SELF-e team decided to create a larger event, that was modeled off of previous, smaller events, that would help their customers to accomplish this goal. Then, the event started catching the attention of other libraries and industry leaders that wanted to be a part of it and it became much larger than SELF-e.
Today, we are thrilled to see that almost 300 libraries will be coming together to support their indie communities through Indie Author Day, and that dozens of industry leaders such as IngramSpark, NaNoWriMo, BookLife (part of Publisher’s Weekly), Indies Unlimited and more have reached out to show that they also care about fostering this relationship. We look forward to the actual event and what is to come over the next year. 6) This is the first year that Indie Author Day will be held, what are the future plans for this event? To start, Indie Author Day will become an annual event. Then, in the time between this year’s event and next year’s, the Indie Author Day website will offer authors and libraries more ways to come together through webinars and other programs. We will also be expanding the event to include new countries where we see enough interest. So, authors that are currently located in a country outside of the U.S. should let their library know about Indie Author Day and encourage them to reach out to us through the library form on the Indie Author Day website! 7) Is there anything I didn’t ask, but you’d like to share? First, I’d like to take a moment to thank you for getting the word out about Indie Author Day. Then, I’d like to reiterate that all authors who are interested should get out there and visit their nearest library to support their local indie communities. It can be tough getting recognized as an indie author, and this can be the first step in the right direction for a lot of writers. For those out there who are not near a participating library, make sure that your library knows that this program exists and is free to get involved in for next year. It often helps a library to get on board if they know that they have people in the community who would be interested in attending and potentially participating in it. We’re so excited about the positive response we have gotten so far and can’t wait to hear more about each unique event that happens on October 8th!